As I turned right into the entrance of the Medway, the stiff wind and tide that had flushed me down the Thames like a crazy bob-sled went berserk. It was an explosive situation… literally. I was bearing down backwards – the howling, backing cross-wind and tide now both working against me – on the wreck of the munitions ship Montgomery, sunk in 1944 and still with 1,400 tonnes of extremely volatile TNT on board. There’s an exclusion zone round this relic of war, and they say if she blows it’ll blow out all the windows on the Isle of Sheppey and create a mini tsunami. Sails down, 4hp outboard motor thrashing away, when I throttled up Marlin slammed and crashed and the outboard was either half submerged or racing in thin air. When I eased the throttle back I was being sucked down on the rusting superstructure jutting out of breaking seas the colour of rust. In truth, there were any number of simple things I could have done to avoid the situation or get out of it, but the brain wasn’t working. And in the end, it was the slackening ebb that gave me a break and allowed me to inch my way into Queenborough and tie up for a rough, restless night. As I dozed fitfully Marlin, my beloved little 18ft Sailfish sailing boat that had done so much for me, bashed and crashed against the pontoon. With each crunch I felt her hurt, and her hurt was mine, because Marlin and me we’re one, a unit, not me and Marlin against the world, but me and Marlin a world entire. “Marlin,” I pleaded: “I’m sorry, I’ve let you down, I’ve hurt you.” For what kind of idiot was it who concocted Marlin’s Mission? 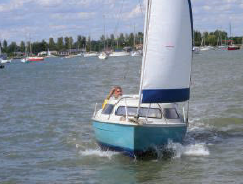 To sail a small boat 340 miles from Essex to the Southampton Boat Show to demonstrate that cost is no barrier to getting afloat, that the sea and sailing and all it has to give belongs to all of us no matter how modest our means. Marlin had given me all of that, but she’d given me more. When I lay in hospital paralysed from the waist down my whole world was a bed, a bedside table, a glass of water, a pee bottle and a gantry of bleeping, green-glowing instruments, a shrinking universe closed in by a curtain. I don’t know if it was the drugs, but I had nightmares too… of poodles! They appeared to me like those ferocious, slobbering lions you see engraved in those ancient leather-bound library tomes that showed a world once beyond imagining. As the lion-poodles leapt from the past and snapped at my useless legs couldn’t kick them away. But where did they come from? The answer was in a distant past just days before. Over the course of a week or so, during which I’d felt “fluey,” I’d also been struggling with what I thought was an extremely bad back. And then I awoke one morning to find my legs wouldn’t work at all. 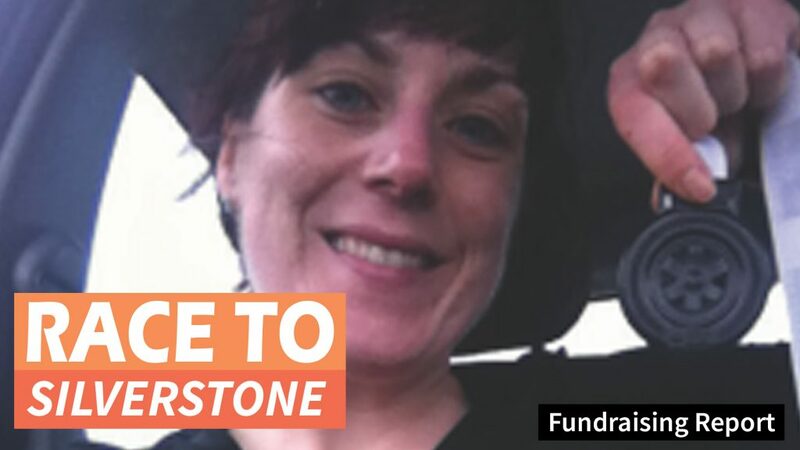 My girlfriend came round, called an ambulance, then a paramedic arrived and my girlfriend – Jules was her name – said she had to go and get her poodles groomed. The paramedic woman shot me a funny glance – knowingness, sympathy, compassion, or worse, pity perhaps – things I couldn’t read or understand, because poodles have to be groomed, you know. That takes hours, and it took several hours too, for the ambulance to arrive, as the paramedic sat patiently by. And that’s how Marlin’s Mission began, although I didn’t know it at the time. For as I surveyed my tiny curtained universe I realised my entire world was no larger than a Sailfish. I imagined the curtains were not drapes closing in my world, but a horizon of cotton-wool clouds and blue skies inviting me to a world beyond. All around me I had everything I needed for life at hand, just as when sailing Marlin, for perhaps the biggest marvel sailing has to give is to tell us how little we need and how lucky we are. This was my mission: to helm this little ship. All I needed was a course to steer, to take charge, to become captain of my destiny. To do that I had to take responsibility for myself, rather than hoping that a poor damaged poodle woman who was too hurt to cope with her own feelings could care for me and my emotions. It was too much to ask. A relationship ended and a new life began, and here it was all in tatters, a beaten-up boat and a broken-up man on the verge of giving up. What fool thought up Marlin’s Mission? In these situations, a hearty breakfast helps, but friends help even more. Sailing buddies Mark and David had heard of my plight and early that morning in Queenborough, as the wind howled through empty streets, they turned up after driving 150 miles to sort me out. “The wind’s going down, the tides are right,” they cajoled. “Let’s poke our nose out in to the Thames and give it a go?” We had the sail of our lives, 42 miles to Ramsgate in under seven hours, in a Sailfish, spectacular. We even made tea on passage, even more spectacular. And then it came to me. This was what Marlin’s Mission was all about. I imagined that when I set off last July from Maldon I’d be alone, doing it all solo, a man on a mission, but it wasn’t my mission, it was something bigger, and people bought into that. 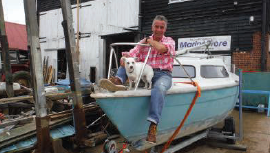 Along the south coast, I never once sailed alone, as people came out to join me and welcome me wherever I moored overnight. 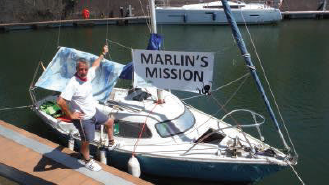 At the Southampton Boat Show, where Marlin was on display, I dressed her overall in bunting, bras and knickers, and flew GAIN banners, and each day gave a talk to demonstrate how anyone can get afloat, that cost and disability are no barriers, and also to raise money for GAIN. 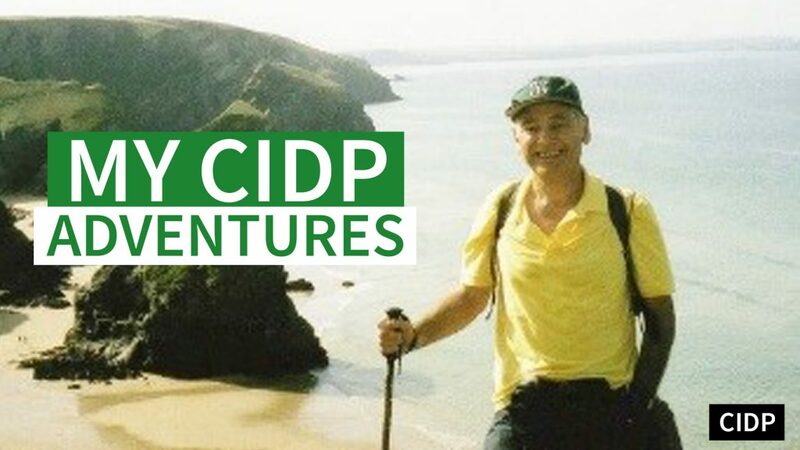 When people with personal experiences of GBS or CIDP, my particular variant, came up to talk to me I began to understand how important and wonderful it is to share experiences. 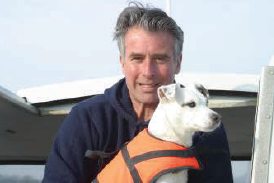 And just to think, what began in a very dark place, a low ebb, a failed relationship, has become Marlin’s Mission, one of the very richest experiences of my life. And the mission continues. These days, when I give talks at sailing clubs who contribute generously to GAIN, I say that if someone could wave a magic wand that means I no longer need to spend three days in hospital every five-and-a-half weeks having IVIg treatment I’m not sure if I’d want that. Don’t get me wrong, I don’t want to be ill, although once I did, as I thought it might make the poodle woman show me she cared. It’s just that through my illness the very most wonderful things in my life have happened. When, reluctantly perhaps, I took responsibility for myself I found that strangers became friends and all my good friends became better friends. I wouldn’t change that. I’m a lucky guy. Marlin’s Mission will never end. To date we’ve raised over £7,000 for GAIN. And the poodle nightmares aren’t as bad as they once were.